This most ancient and beautifully scripted alphabet is said to originate around 1000 years BC (Wikipedia). Since that time, every letter of this beautiful script has been woven into and become a part of Hebrew myth and culture including of course, the Holy Kabbalah and the Tarot, of which we shall have much to say throughout this series of essays. For centuries, every letter has been exhaustively studied and documented as a fundamental part of creation in a literature of vast scope. This essay cannot cover all of that ground, but we will tell you the meaning of each letter traditionally, within the Kabbalah, and the tarot. We hope you enjoy it - now let's begin! On the Tree of Life, Aleph sits on the path between the source of all creation, Keter, and Chockmah, the 'male' force released. This force is unconstrained, innocent and unknowing, but all-powerful and quite reckless! It is unconstrained power without direction, phallic and altogether joyous, bursting upon the world. We will provide you with an in-depth article on the Tree of Life in a later article, but for now we'll stick to each element as the Hebrew alphabet unfolds on its paths. In this case we see Keter, the static point source of the universe unleashing it's potential energy into a physical universe in an astounding release of energy represented by Chockmah, the male force. The links between the 'Sephiroth' (Keter and the other nine circles) or 'emanations' on the tree are known as paths, and there are 22 of them - one of each letter of the Hebrew alphabet. Aleph sits on the first path. Please note that the path attributions shown in some of the sources we have linked to here are the modern ones assigned by Aleister Crowley. the older attributions were often meant to deceive inquirers and obscure sacred truths, restricting them to an authorized priesthood. In Hebrew and Kabbalistic tradition, Aleph is said to represent an Ox. When we inspect the early Hebrew version of the letter we see the image below, which indeed resembles the head of an ox. The significance of this is that the ox represents fertility, the plowing of the ground to generate new growth in the spring. It has the numerical value of one, and as such represents the beginning of all things. It is the explosion of new growth and life. This is The Fool from the Thoth tarot deck by Aleister Crowley and Lady Frieda Harris (the artist). The first thing to notice in our discussion is that the letter Aleph appears at the bottom left of the card, indicating its place om the Tree of Life (above). The spirals represent the spiral, whirling force of the universe and and prefigure our discovery of curved space-time. they also represent the 'three veils of the negative' above the Tree of Life from which the universe is distilled. The crocodile is ready to attack and devour the fool, whose innocence renders him unaware. In devouring the fool, the tiger would in fact be returning the fool to his origins of infinite potential. This is the symbol that shows that in every beginning the end is also foreshadowed. The grapes in the left hand of the fool indicate the fertility we referred to earlier, as does the strong presence of green. The Tiger represents fear, but the Fool ignores it as he springs forth to create his destiny. The dove represents the penetration of the physical universe by spirit. this is an important doctrine recognized in Christianity by the descent of the Holy Spirit into men. The flaming pine cone above the grapes indicates a powerful gushing of creativity. The Fool's Horns are equivalent to the horns of Dionysus ( the god of the grape harvest, wine-making and wine, of ritual madness, fertility, theater and religious ecstasy in ancient Greek religion and myth.) Again, we see fertility in this symbolism. 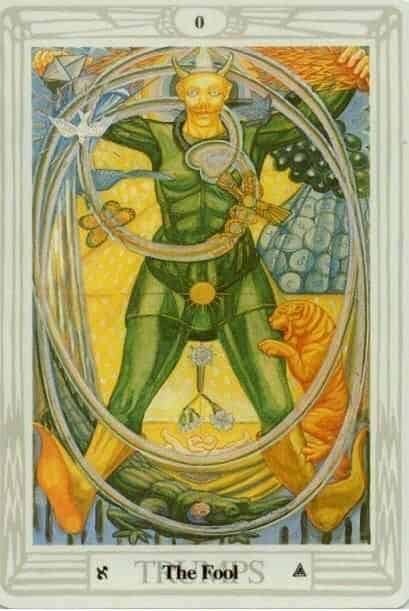 Alchemical Air - At the bottom right hand side of the card we see a vertical triangle, which represents one of the four keystones of alchemy - Air, (the others being Fire, Water and Earth). There is also of course a fifth element, 'Spirit'. i wonder if this is what the writers had in mind when they wrote the story that became an excellent movie with Bruce Willis (called the 5th element!). Air is the katabolic energy of intellect that penetrates everything; it is the silent breath that maintains life. The sack of coins - Each of the coins is inscribed with the symbol of a planet, indicating further the descent of the potential of Keter into a swirling universe based on matter as an aspect of energy. This also foreshadows the development and differentiation of the forces of nature as matter unfolds. For instance, Mars foreshadows the severity of the catabolism innate in the severity of judgement that results in war, whilst Jupiter signifies the opposite - tolerance and the anabolism of nature. The Number Zero - At the top of the card we see the number zero. This is hugely significant in both mystical philosophy and science. Zero is indeed a non-intuitive and strange idea. After all, how many of us (engineers aside!) begin counting at zero? Zero is the potential for all things, the state from which everything emerges. This card is attributed to the letter Aleph, whose number is 1, because it connects to Keter, the projection of one from the veils of negativity above, which are zero. So here we have the beginning of everything, projected into one dimensional space. As soon as we arrive at the first projection of zero, 1, we are confronted by dimensional expansion. This is the basis of Aleister Crowley's equation for explaining existence, 0=2. The world that you see before you"
This is a deep doctrine that applies to every spiritual and physical aspect of our universe, but it is complex. For now, you may simply consider again that the letter Aleph represents the beginning of all things and all things to follow are foreshadowed in it - it contains all the other letters. This is the true meaning of the card called 'The Fool'. The video below is the property of the Ancient Hebrew Research Center. It's brief and quite fascinating. Essential Oils for Cancer – do they offer hope?